‘Barcelona, Cataluña and its springs. SELECT-GUIDE. 1916 400-page illustrated guide book, by JOSÉ Mª FOLCH I TORRES, of the ‘Association for the Attraction of Foreigners’. The first photograph shows part of the dining room of the Pensión Hispano-Americana. Below, the same space as it is today. It is perfectly recognisable by the ceiling, since the wall on the left – which conceals the columns - is no longer there, and by the sliding doors in the background. The floral décor of the walls are also visible in the photograph. 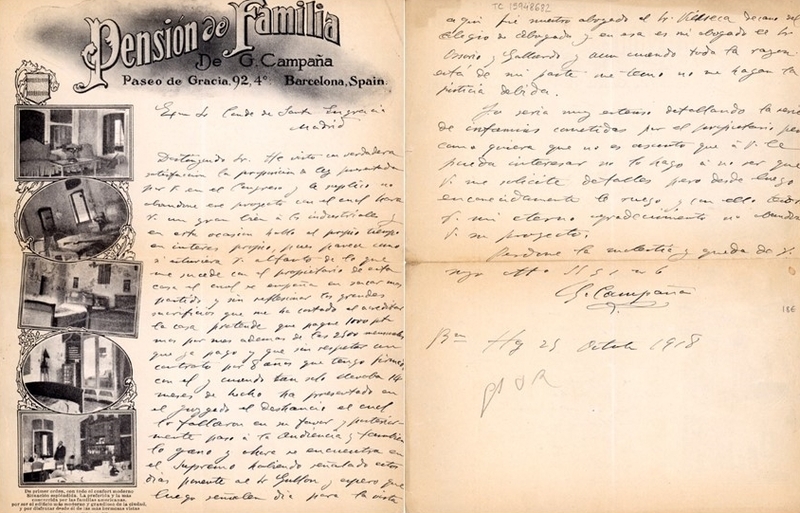 Letter from the owner of the ‘Pensión, G. Campaña’, written on 25 October 1918. Detail of the letter paper of the ‘Pensión de Familia de G. Campaña’. The following story is a good example of Gaudí’s famous saying, that that originality consists of returning to the origin. We have long wondered to what purpose the mezzanine floor was put before the Mosella tailors set up shop there. We have now found a document confirming that this space on the Passeig de Gràcia side of La Pedrera was used as the restaurant of a boarding house, the ‘Pensión Hispano-Americana. We know that prior to the signing of the certificate of completion of the building work, the first ads had already appeared in the press offering rooms to rent in Casa de Milà in February 1912. According to the first advertisement, the rooms were located on the building’s fourth floor. Although there is no information about the exact part of the building, it seems that the rooms only in the Passeig de Gràcia side of the building. “Splendid rooms for married couples or families, lift, electricity, heating, bathrooms, telephone. No. 92, Paseo de Gracia- 4th Floor (Casa de Milá).” La Vanguardi, 6 February 1912. On 30 April 1914, the until-then nameless boarding house became the ‘Pensión Hispano-Americana’, perhaps because by then it had all the necessary permits. “Pensión Hispano-Americana. Splendid rooms with room service, bathrooms, lift, telephone and all modern conveniences. Affordable prices, electricity, heating.” La Vanguardia, 30 April 1914. 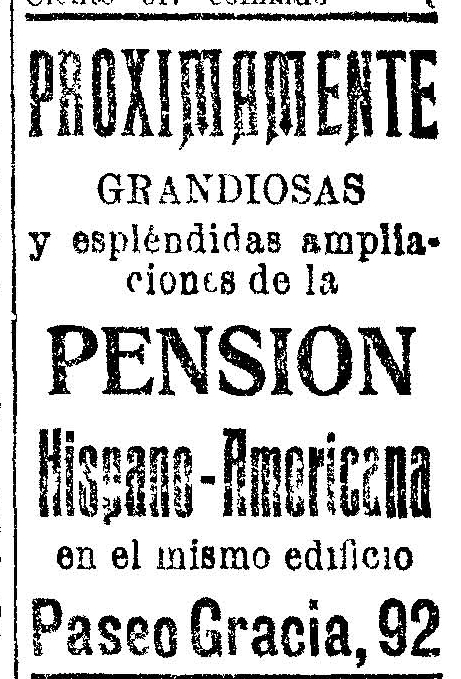 Two years later, new ads were published announcing the expansion of the Pensión Hispano-Americana. "COMING SOON. 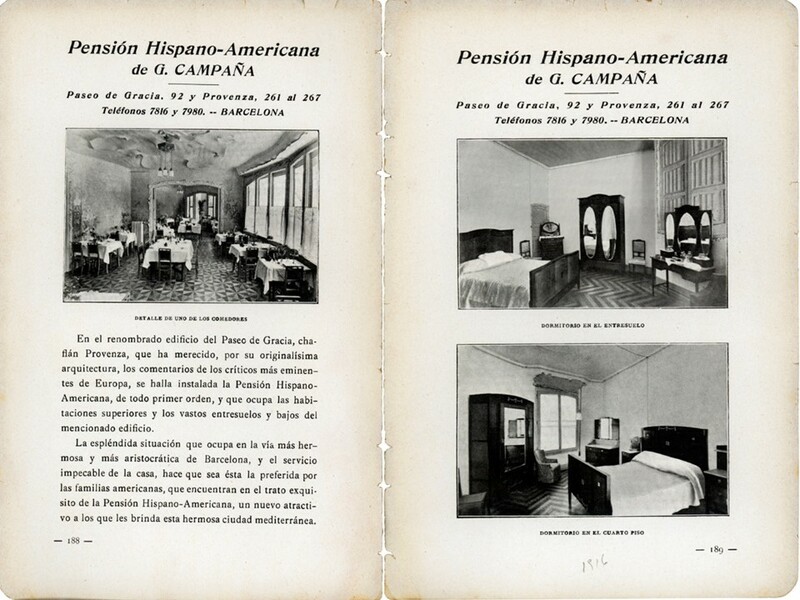 THE GRANDIOSE and splendid expansion of the PENSION Hispano-Americana in the same building No. 92, Paseo de Gracia." Further, a 1916 guide book to Barcelona, ‘Barcelona, Catalonia and its springs” features a double-page advertisement, lavishly illustrated with photographs. These photographs offer the first glimpse of the boarding house and its expansion, which consisted of the installation of a dining room on the mezzanine floor of the Passeig de Gràcia side of La Pedrera, as well as bedrooms traversing the entire floor to the carrer Provença side of the building. 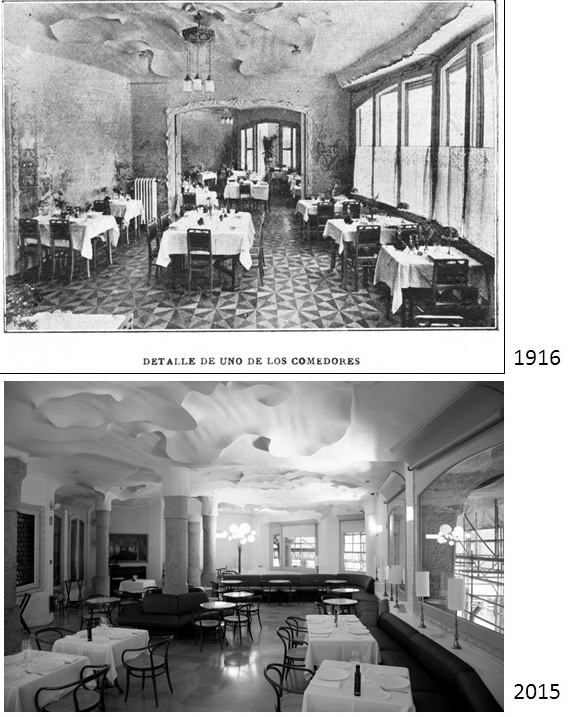 It is also remarkable that “one of the dining rooms” occupies the same space in which the actual Cafè de La Pedrera is located. The advert, or ‘advertorial’, features three photographs: one of the dining room (the current Café de La Pedrera), a bedroom on the mezzanine floor and another bedroom on the fourth floor. The copy is striking for how it highlights what the advertisers saw as the ‘added value’ of a boarding house situated in one of Passeig de Gracia’s most “eminent” buildings. “The renowned building in Paseo de Gracia – on the corner of calle Provenza – which, thanks to its original architecture, has been praised by some of the most distinguished critics, is home to the first class ‘Pensión Hispano- Americana’, which occupies upper-floor rooms and the spacious mezzanines and basements of the mentioned building. The first photograph shows part of the dining room of the Pensión Hispano-Americana. Below, the same space as it is today. It is perfectly recognisable by the ceiling, since the wall on the left – which conceals the columns - is no longer there, and by the sliding doors in the background. The floral décor of the walls are also visible in the photograph. The other document relating to the boarding house is a letter, fruit of a contribution from Mrs Anna Buti to La Pedrera’s Untold Stories. The letter is exceptionally significant both for the paper on which it was written and for its content. Printed on the left-hand side of the note paper are five photographs of the boarding house’s interior. It’s interesting to note that despite advertising itself as the ‘Pensión Hispano-Americana of G. Campaña’, the letter is headed ‘Pensión de Família de G. Campaña’. Dear Sir. I was overjoyed to see the legislative proposal you put forward in the Congress and I urge you not to abandon this project, because it will be for the great good of the industry. This also concerns me personally as it seems as if you were aware of my dispute with the owner of this building, who seems determined to take advantage of me without considering the huge sacrifice I have made to certify my business. He is demanding that I pay a further 1,000 pesetas a month, in addition to the 2,500 that I am already paying. He does not wish to honour the eight-year lease I signed only fourteen months ago. Indeed, the court has granted him an eviction order, which was subsequently upheld by the High Court and is currently in the Supreme Court, where Judge Gullon will be presiding, even though the date of the hearing has yet to be confirmed. Although I have Mr Vilaseca, Dean of the Bar, and Mr Osorio y Gallardo to defend me, and as I believe when I am entirely within my rights, I fear that justice will not be delivered. I could go into greater detail about the series of infringements by the owner, but as I believe this is not a matter that would interest you, I WILL NOT DO SO unless you request further details from me. However I strongly urge you not give up your project, for which I would be eternally grateful. The letter, signed by the boarding house’s owner, G.Campaña, is addressed to the Count of Santa Engracia in Madrid. The Count of Santa Engracia, Francisco Javier Jiménez de la Puente (1883-1936), was elected deputy to the Madrid parliament by the Monarchical Coalition from 1910 to 1923. In 1918, he presented a proposal to the Grace and Justice Commission “concerning the regulation of rents of buildings and premises”. The letter refers to a lawsuit brought by the owners of La Pedrera, Mr and Mrs Milà, concerning a rent dispute. It seems that following the expansion of the boarding house, the Milàs tried to raise the monthly rent from 2,500 to 3,500 pesetas. After this date we have found no further reference to the ‘Pensión Hispano-Americana’. We do know that in 1928 Sastreria Mosella set up their tailoring business on the mezzanine floor and that their owners affirmed that the space was vacant and housed no other business.